USB TTL Serial Cable allows easy interfacing to devices over USB. The USB TTL Serial cable provide connectivity between USB and serial UART interfaces at 5V. 3.5mm audio jack input/output. TTL-232R Converter Cable provides a USB to TTL Serial interface with various end connectors. On board, FT232RL provides single chip USB to asynchronous serial data transfer interface. Entire USB protocol handled by the electronics in the cable USB. UART interface support for 7 or 8 data bits, 1 or 2 stop bits and odd / even / mark / space /no parity. Internal EEPROM with the user-writable area. 5V CMOS drive outputs and 5V safe TTL inputs make the TTL-232R easy to interface to 5V MCU‟s. FTDI‟s royalty-free VCP allow for communication as a standard emulated COMport and D2XX „direct‟ drivers provide DLL application programming interface. +5V or +3.3V output allows external logic to be powered from the USB port. 6-way outputs provide Tx, Rx, RTS#, CTS#, VCC and GND (except Audio Jack which provides only TX, RX and GND). 8 way, keyed connector to support FTDI VDRIVE2 and VMUSIC2. 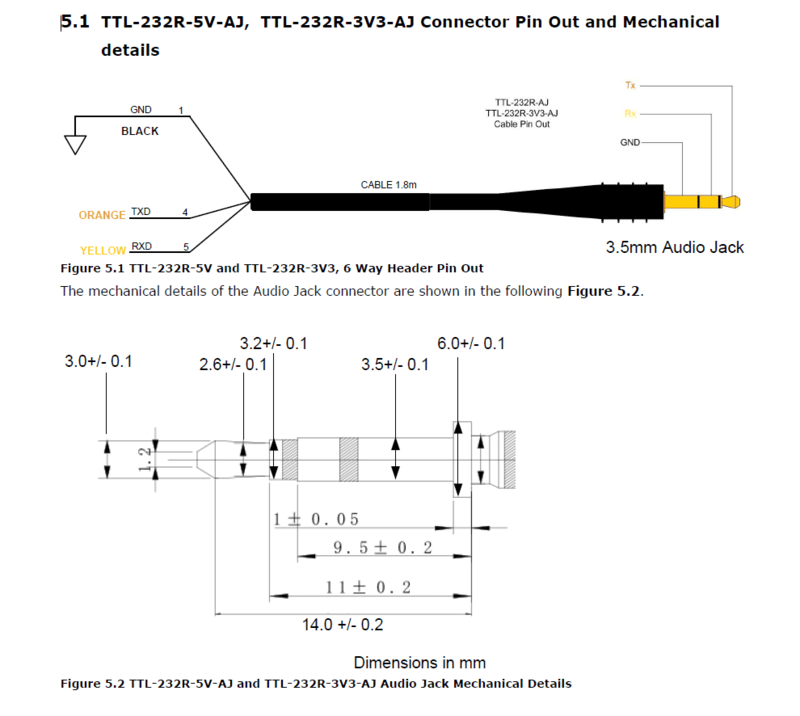 3-way Audio Jack connector provides Tx, Rx and GND. Cable length is 1.80m (6 feet) or customized. Custom versions also available (subject to MOQ). USB TTL Serial Cable allows easy interfacing to devices over USB. The USB TTL Serial cable provides connectivity between USB and serial UART interfaces at 3.3V or 5V.